Network security has been fundamentally reactive, as Pat Gelsinger (CEO of VMware) stated in the opening keynote at VMworld 2018, “There is something fundamentally broken about the traditional security model.” Security comes as an afterthought as organizations put infrastructure and applications first. A defensive strategy is always more difficult compared to an offensive strategy. The security ecosystem is important to reduce security attacks, increase threat intelligence and proactively protect on-premises data center, multi-cloud, mobile and user environments. Security remains top-of-mind for a majority of organizations. Worldwide spending on information security products and services will reach over $114 billion in 2018, an increase of 12.4% from last year, according to the latest forecast from leading research firm Gartner. AppDefense on compute — vSphere Platinum Edition includes AppDefense out of the box, so a virtualization team can easily learn the purpose and intended behavior of VMs, lock down a VM if it misbehaves and adapt as an application changes. NSX on network — NSX introduced the concept of micro-segmentation years ago. Now combining AppDefense and NSX, VMware announced next-generation micro-segmentation called adaptive micro-segmentation. Along with the application changes, NSX can automatically create micro-segmentation rules to adapt it (i.e., DevSecOps approach … everyone is responsible for security). Workspace ONE on user — Security on the user side typically requires IAM and access policy. In other words, “Are they who they say they are? Are they on a trusted device? What are they allowed to access?” The idea behind Workspace ONE is to break these decision silos and provide a unified framework to bring analytics and insights together to better determine behavioral anomalies in real-time and make decisions on it. 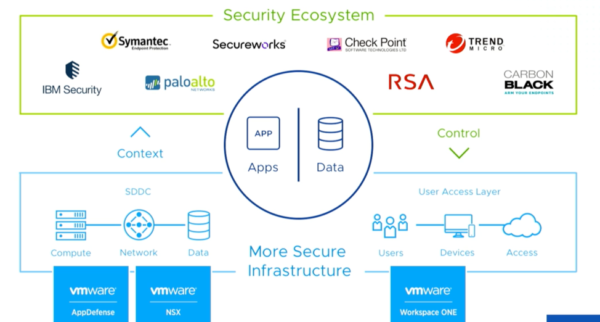 VMware is focused on security along with its multi-cloud strategy. New beta cloud services called “VMware Secure State” was announced, providing compliance monitoring and policy enforcement in real-time across cloud environments. It indexes cloud assets and builds a cloud infrastructure model to easily find cloud-native vulnerabilities, so that it can provide contextual information and “connected threats” across configured cloud service layers. It also automates configuration security and compliance monitoring in native cloud environments, addressing cloud configuration violations in real-time. VMware stated, “It allows organizations to proactively scale actionable security insights across cloud teams and helps prevent costly security breaches and fosters innovation.” Currently, it supports both AWS and Azure. The Kovarus partnership with VMware and other vendors such as Cisco, Juniper, Palo Alto Networks, etc., in addition to our focus around Cloud Automation, put us in the best position to be vendor agnostic and help customers choose the right security solutions for their environment.